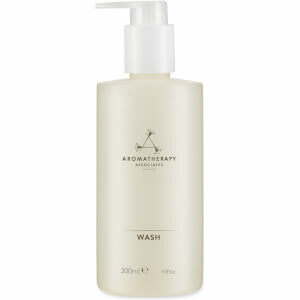 Experience the benefits of the Aromatherapy Associates Relax Body Wash; a gel-based, beautifully scented formula that works to pamper the skin and senses. Utilising Coconut Extract (a natural foaming agent), the luxurious wash gently cleanses and softens skin, whilst a blend of Lavender, Petitgrain and Vetivert Essential Oils help to calm and soothe the mind. Perfect for relieving daily stresses and promoting a peaceful, undisturbed night's sleep. Simply step into the shower, apply a pump or two and massage onto the body to a rich lather and allow it to sink into the skin. Rinse. Aqua (Water), Sodium C14-16 Olefin Sulfonate, Cocoamidopropyl Betaine, Disodium Laureth Sulfosuccinate, Cocamide MEA, Polysorbate 20, Lavandula Angustifolia (Lavender) Oil, Cananga Odorata (Ylang Ylang) Flower Oil, Citrus Aurantium Amara (Bitter Orange) Leaf/Twig Oil, Pogostemon Cablin (Patchouli) Leaf Oil, Vetiveria Zizanoides (Vetivert) Root Oil, Parfum**, Glyceryl Oleate, Coco-Glucoside, Sodium Cocoyl Isethionate, Phenoxyethanol, Sodium Chloride, Citric Acid, Sodium Benzoate, Benzoic Acid, Coconut Acid, Dehydroacetic Acid, Sodium Isethionate, Panthenol, Tocopherol, Hydrogenated Palm Glycerides Citrate, Benzyl Benzoate*, Linalool*. *Natural Essential Oil Contents **Natural Plant Extracts.